﻿Ed Wood's "Classic" has taken a few batterings down the years. Without question his biggest film but also considered to be one of the worst films ever made. Well... I saw this in the local unnamed generic Pound Shop and chomped at the bit. £1 for a classic was far too good a deal to pass up. Having only ever known Bela Lugosi as the star of real classics like Dracula and White Zombie, I was quite intrigued to discover why this outing had such a bad reputation. This was the last film of an underappreciated career for the Hungarian master. One which sadly, he did not see through. Lugosi died of a heart attack during filming, so footage from some of Wood's' other side projects, which also featured Lugosi were used. They brought in a replacement actor to do the filler. However, not to very good effect as all scenes involving the stand in were shot with him covering his entire face with a cape. Sad to say that Lugosi's legacy is a much more modern sentiment. As a hard working actor in Hollywood during the 30's, 40's & 50's, Lugosi battled low paying jobs, drug addiction and of course, he was a foreigner at a very difficult time for world relations. Quite possibly his and one of the fledgling arts' most iconic moment came when he donned the cape and fangs of one Count Dracula in 1931. A role which saw him earn a measly $3,500, which in today's inflated market comes in at just over $46,000. Lugosi's role in this film will possibly stand out in his career but for all the wrong reasons. 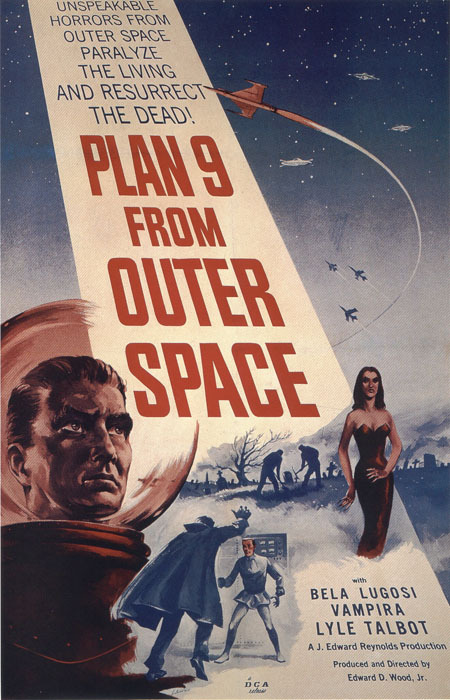 Plan 9 is a science fiction film with so much promise and a decent idea, just very poorly executed. You can forgive the flying saucers with the clearly visible string and the cardboard sets but one thing that can never be forgiven is the continued use of the same scene over and over as we see Bela Lugosi walk through the graveyard again and again and again. As with most films of this era, it was all about the voice over guy. Even with its ridiculous plot, you can almost hear the voice now "Unspeakable Horror's from Outer Space! Paralyze the Living and Resurrect the dead!!!" he says in his prime theatre tongue. Some special mention must also go to Vampira, a.k.a Maila Syrjäniemi plays an instantly recognizable "Vampire Girl" with sharp nails and pointy eyebrows. Everything the average 1950's person would imagine a female vampire would look like.